FITS MOST DOUBLE STROLLERS ★ this gate check bag is HUGE! Dimensions: 47" tall, by 24" wide, by 18" deep. Created to fit most double strollers / dual strollers, standard jogging strollers. HASSLE-FREE & FUNCTIONALLY EFFECTIVE DESIGN ★ the stroller travel bag comes with 2 padded backpack straps help keep your hands free such that you can easily show tickets, hold your baby or even sip a cup of coffee at the airport. 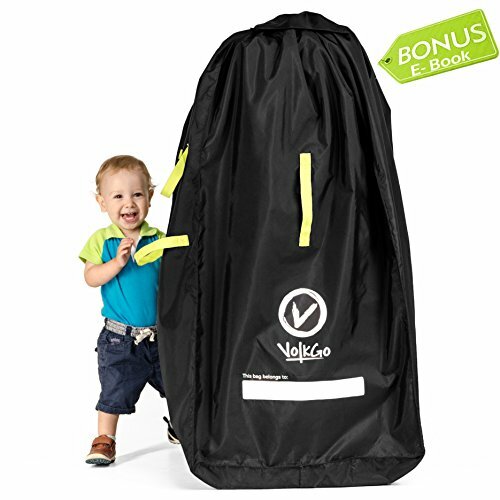 EASY TRAVEL ★ VolkGo Stroller Bag makes it extremely easy to carry a baby stroller along with you even when traveling. With our stroller bag for air travel, you can Gate Check the bag & SAVE MONEY! IMPROVED SAFETY ★ provides protection to toddler/infant stroller against dirt and in turn, helps keep your baby healthy & safe. DURABILITY AND PROTECTION ★ travel bag for stroller made up of highly DURABLE NYLON which is water-resistant and is stitched using state of the art technology - offers complete wear and tear protection.